Dante's Inferno Ships, but Is It a God of War Clone? Lying on the table beside me is an action figure modeled after the star in Electronic Arts' third-person action game, Dante's Inferno. Dante looks none too happy. That might have something to do with all his missing skin, flayed from his chest in crisscrossing strips to form a bloody cross. You can make out faint pictographics etched over the exposed musculature. 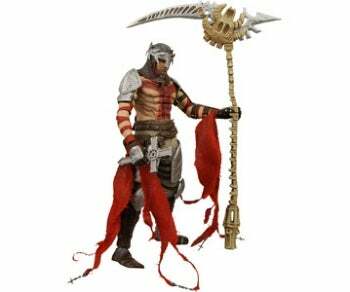 It's like something cribbed from a Clive Barker line of Opus Dei toys. Beside this posable plastic masochist lies a copy of Dante's Inferno "An Animated Epic" (an 88 minute DVD movie), the second issue of a comic book based on the game, the original text of the infamous poem in the Longfellow translation, and a copy of the game itself, out today for Xbox 360, PlayStation 3, and PSP. EA clearly wants us to view Dante's Inferno as important in the sense that it's 100 percent merchandized. You probably want to know if the game's any good. I've only played through the first few levels, but sure, it's a kind of Roman Catholic version of Sony's God of War, and in that sense, a decent enough romp through an alternate horror-verse. As for the story, what was God of War's again? Yeah, you're not supposed to think in a game like this, just do. You know the drill, one guy against a million enemies, they with two or three special moves against your two or three dozen. You move along a set path, in this case carved through levels designed to celebrate the poem's nine hellish circles. You unlock new combos which let you better hi-YUH! the crap out of undead minions. When you reach the end of a level, you're obliged to throw down with its boss. And yes, several female creatures run around with their shirts off, if it matters. 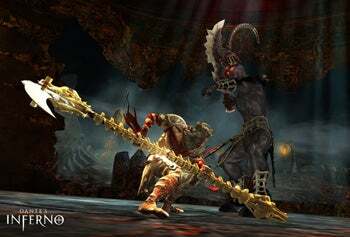 Just a God of War clone? Maybe, but another question might be "Is that so bad?" Can you think of any other recent God of War clones? I can't (Don't say Devil May Cry 4, because it's not). And in case you're thinking of playing the "Like we need more of…" card, it's not like the market's deluged with this particular kind of high-octane hack-and-slash. I'm not saying it's worth the $60 EA wants for either of the console versions, and I've read the final levels have problems, but if this kind of game is your thing, I don't see anything about the controls or enemy AI or level design or puzzles that stands out, at least initially, as clunky or criminally derivative. Then again, God of War III shows up this time next month, and you could always kill time with a copy of BioShock 2 (PCW Score: 5 out of 5).